A couple more articles caught my eye over the past few days. Many people have likely already seen the article from yesterday’s NYT on Amish farms damaging the Chesapeake Bay through farm runoff. This issue has existed for a number of years, but this was interesting to see written about for a couple reasons: one in that it offers another example of an Amishman accepting government aid. Lancaster farmer Matthew Stoltzfus has taken government aid to build a manure pit. Going against taboos against receiving government assistance, some Amish have occasionally participated in government programs. This has happened in a few instances recently, most notably in northern Indiana, with some Amish made jobless by the downturn in the RV industry electing to receive unemployment payments. Another point of interest is that by the sound of the article, the government seems to be intent on taking some action now, and with Lancaster leading the list of counties contributing pollution, seem to be lining up the Amish in their sights. It will be interesting to see to what degree the Amish will be regulated and the implications of any eventual government mandates. If you confine your question solely to individual facilities, I have no doubt if one went looking they could find an Amish farm that causes more water pollution then a well run pork factory. Likely you could even keep a fairly even count going even measured by total pollution. If you look at the total system the answer becomes less clear, because then you also start looking at midwestern corn farms and how that corn is transported to feed pigs in North Carolina. You can manage wastes effectively on small, mixed system farms. However some of the changes do impact both economic and aesthetic concerns — by fencing off streams and ponds and letting them grow into brushy / tree lined areas you increase the work for the farmer (who now needs to water pastured cattle, a significant proposition if you don’t have electric powered wells), you reduce his available acreage for forage (in a place like Lancaster County where space is at a premium already, a big issue), and you also impact the what most Americans view as bucolic scenery (don’t forget Lancaster County is built as much on tourism as anything else). The second article that caught my eye, in the East Central Illinois News-Gazette, addressed an unlicensed individual posing as a chiropractor and treating Amish in Illinois, as well as in other communities. On the one hand employing unapproved forms of treatment can be potentially dangerous. On the other, based on his apparent popularity, it seems like this individual was probably providing a service that people valued. Recently in Ohio an Amish friend spent a lot of time talking about an individual from out of state who sounded similar to this one. For $250, he would perform a special treatment on the “atlas vertebra”. Apparently one procedure was enough to rid a body of ailments. A friend of his had gone to be treated in the hopes of alleviating daily migraines, with apparent good results. Amish tend to put more stock in remedies others may consider suspect. In some cases, however, there may be something to these practitioners and treatments they offer. I can weigh in again on this – I lived in Maryland and raised sheep in Maine and New Brunswick. There were few barriers between fields and waterways on Chesapeake Bay just a few years ago; I noted back then that corn farmers were polluting the watershed as well as promoting erosion. None of those farmers were Amish. Unless animal waste in controlled or if it is controlled without much forethought, waterways and ground water will be polluted. A little effluent won’t harm a healthy river, but most rivers aren’t very healthy in the eastern United States. For years we’ve been told to “get them cows out of that stream!” In other words, fence off the pasture from the water, and use a ram (a hydraulic pump) to move drinking water up to the animals. The small ruminants, sheep and goats, tend to be quite fastidious about their drinking water, and don’t tear up the banks as much. Cattle and horses, especially cattle, are less discriminating and cattle hooves are really hard on soft ground. I agree with you – with education and some incentive to manage waste better, I’m sure the Amish (and others) will get with the programme. But is part of the issue that Amish and other old-fashioned farmers spread fresh manure on their fields? There’s nothing better for building soil, but if it hasn’t been composted at all there can be pollution if there’s a heavy rain. So are the fertilizer companies somehow involved in all this? Growing up in the cornfields of Indiana, I always wondered where all the corn went. Fence rows were wiped out and livestock liquidated to make bigger corn/soybean fields. After living in Lebanon and Lancaster (current home) counties, I know now. It seems the logistics of shipping grain from the Midwest to the seaboard is better than shipping the meat. 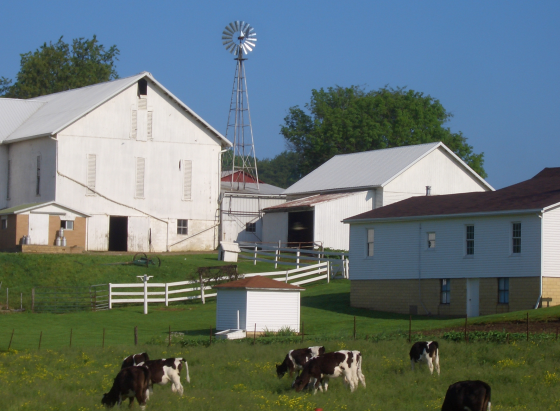 Hence, you have Midwest grain shipped to the seaboard , which is fed to oodles of livestock(in Lebanon County, we had about 10 huge hog or chicken barns within a mile of our house; here near Terre Hill it is more dairy), which have an output that has to be disposed of. It’s good for the soil! That means that the grain fields of the Midwest are not getting the “feedback” of the manure, and Lancaster County gets more than normal. What will the results of all that be in a century? Who knows, but I wonder if the Midwest farmers will regret it down the road. >So are the fertilizer companies somehow involved in all this? This reply actually ties into both Mike & Magdalena’s posts. I don’t think the fertilizer companies are behind this. Farmers in Canada (at least Ontario) have for many years already been made to comply with clean water laws regarding nutrient management. It’s now coming to the U.S. If you look at the New Jersey-sized “dead zone” at the mouth of the Mississippi, you can trace most of that up river to Iowa and Illinois and other corn belt counties. Farmers for years have “tiled” their fields. Tiling being the name that originated back when these were clay tile pipes, similar to the “tiles” used to line chimneys. Today it’s mostly corrugated plastic pipe that comes on large spools, but it’s still called tile. 2) It lowers the ground water table so once you plant corn has to send roots deep (at least to the level of the tiles) to get water. That’s important because the corn is then more resistant to summer time dry spells, with good deep root systems. There’s a couple drawbacks, though. One is it contributes to the ever increasing river floods. Less of the soil acts as a sponge as tiles and drainage ditches move the water quickly to the rivers. To the north especially, this is part of the reason the Red River of the North keeps setting record floods as more and more land is tiled in recent years. Second, when rain falls just after fertilizing it allows the nitrogen and other fertilizers to be leached out and rapidly carried off the land, which ends up eventually at the mouth of the Mississippi (or the Great Lakes, or Lake Winnipeg, depending on which watershed you’re in). In wet years this can become very significant as farmers will repeatedly re-apply fertilizers just to watch another big rain storm develop a few days later and leach it away again. The permanent algae bloom that is feeding on these fertilizers is what creates the dead zone. The Chesapeake is, rightfully, a higher priority right now but the fertilizer companies have to expect that the EPA will soon be going after the “dead zone” and that becomes a big issue…especially in what is the increasingly monoculture corn belt where farmers depend on big production of a subsidized crop to survive, and that crop in turn depends on well drained fields and copious amounts of synthetic fertilizer to produce the needed yields. I predict that government assistance will do far more harm to Amish farmers than the regulation of manure and runoff will do. I want to join the Amish, but I am still paying a mortgage on a home I can’t sell… What can I do? Follow what the Lord asks of you to do, Diana, if you are lead to lead an Amish-like lifestyle you can even do so, most likely, in the house you have a mortgage on. Pray, read the Bible, be plain of dress if you are lead to. Be open and joyful to the wishes of the Lord in your life. I’m not really Amish, but I do respect their ways, and try in my small ways try to be similar..